Click on pictures to see big size. 1. Shoulder to shoulder on the back. 2. Armpit, make loosely like a comfy t-shirt. 4. Circumference of arm hole at the end. 5. Chest, leave room, do not make tight, like a loose, comfy t-shirt or your comfort. 6. Do you want a slit or closed on the side. You can tell how deep you want the slit. 7. Slit measurement from waist to bottom (length) of top or at theigh or so down to bottom. 2S: Length of pant. Give from your hip to ankle, give room for sitting down. As of February 2004, no more orders will be taken. 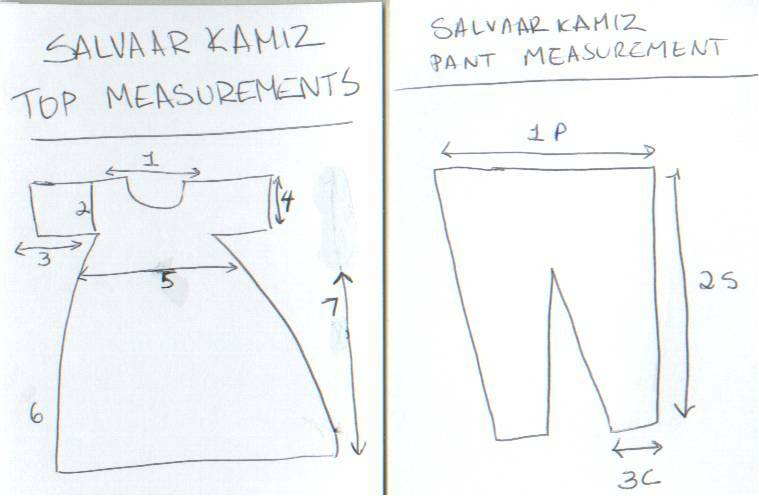 The purpose of this page is to detail to you how one can take measurements to give to a tailor (mostly in India) and have your own salvaar kamiz tailor made. I hope it has been useful. Back to pictures and descriptions of the Salvaar Kamiz dress. This page has been visited times since it's inception in April 2002. Updated February 2004.